From 17th to 22nd September, PhD students and researchers met in Lviv for the EHRI Seminar entitled “Advanced Holocaust Studies Today”. The seminar was organized by the NIOD Institute for War, Holocaust and Genocide Studies (Amsterdam) in cooperation with the Center for Holocaust Studies (Munich). 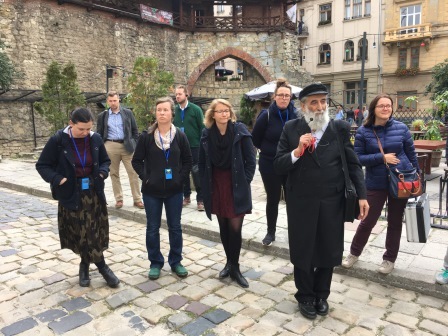 As host and partner for the seminar, the Center for Urban History of East Central Europe (Lviv) provided the necessary on-site organization and a number of excursions as well as presentations on local initiatives enhancing Holocaust research and remembrance in Ukraine. 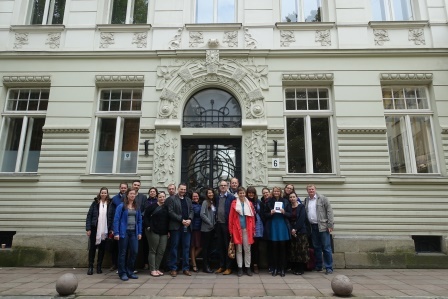 The twelve participants of the seminar, mostly PhD Students, coming from eight countries (Austria, Croatia, France, Germany, Israel, Poland, United States, and Ukraine) benefitted from a mixture of lectures, roundtable discussions, project presentations, film screenings and meetings with local activists as well as excursions to memorial sites, museums and archives that are the cornerstone of EHRI Seminars. That the city of Lviv was chosen for the EHRI Seminar was no coincidence. Before WWII, almost a third of the population of this multi-ethnic city was Jewish, and well integrated into the city’s social, cultural and political life. A lecture by Anastasiia Simferovska on “The Death of Artists and the Survival of Art in Lviv” as well as a guided tour through the Borys Voznytsjy Lviv National Art Gallery with a focus on works by Jewish artists on display there gave the participants an insight into Jewish life in Lviv before the war. However, Lviv also played a crucial role during the Holocaust in Galicia. Soon after occupying the city in the summer of 1941, the Germans established a ghetto and, soon afterwards, the Janowska camp. Throughout the war years, Janowska functioned as a work camp for Jewish, Polish and Ukrainian prisoners as well as a concentration, transit and ultimately extermination camp for Jews from the region. Lviv is therefore an ideal place to examine both the state of Holocaust Studies as well as that of Holocaust education and remembrance in Eastern Europe and especially in Ukraine. The seminar offered ample opportunity to do so. After a brief introduction by the organizers, the seminar opened with a roundtable discussion on “Advanced Holocaust Studies: The State of Field”. Frank Bajohr, Karel Berkhoff, Dieter Pohl and Mykhaylo Tyaglyy shared their experiences as established Holocaust researchers from different regions and working from perspectives and discussed with the participants the need for different approaches to Holocaust Studies as well as the research gaps that still need to be filled. Mykhaylo Tyaglyy then gave an overview of Ukrainian archives and their repositories of Holocaust related material and offered the participants some useful advice for their prospective archival research. His presentation was usefully supplemented, later in the week, by a visit to the State Archive of Lviv Oblast, where Taras Martynenko familiarized the group further with the local archival system and gave us some exemplary insight into the rich source material available there. 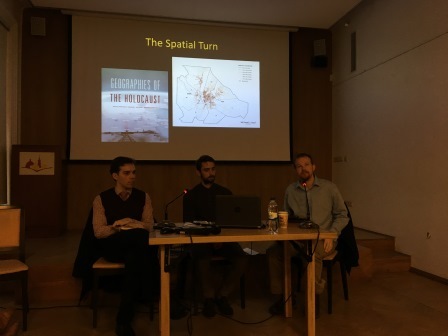 Dieter Pohl’s comprehensive presentation focused on the whole of Galicia during the Holocaust, while Kai Struve shared the results of his most recent research on the pogrom in Lviv in 1941. Another central aspect of the seminar was the presentation and discussion of various methodological issues related to Holocaust Studies. Andrea Löw and Karel Berkhoff elaborated on the need, but also the pitfalls of using pictures for historical research, while Frank Bajohr exemplified the possibilities and limitations of gaining information from the personal notes of high-ranking National-Socialists, based on his work on the diary of Alfred Rosenberg. 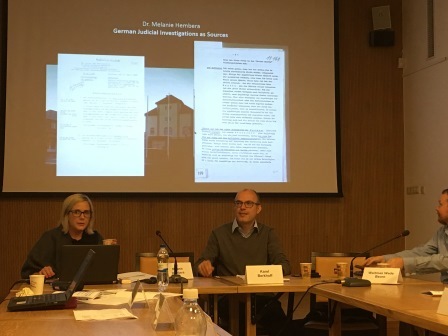 Melanie Hembrera (picture right) introduced the participants to the different types of German judicial investigation files and the questions they can help answer on the crimes committed by Germans during WWII. Nicolai Zimmermann from the German Federal Archives gave the participants an insight into the reading and interpretation of German administrative records. He demonstrated the importance of small details like a shortened signature or the color of a pen to retrace the dispatching of reports, orders and instructions that sustained the German occupation system. In addition, during the seminar, special attention was paid to spatial concepts and spatial approaches to Holocaust Studies. Taras Nazaruk, Taras Martynenko and Waitman Wade Beorn (picture right) presented local and international initiatives in which large data sets are used to detect spatial logics of the Holocaust and to shed new light on movements, relationships and networks of victims, perpetrators, witnesses and bystanders. 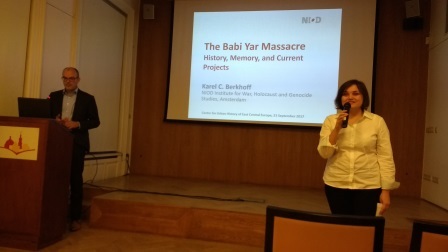 In his public lecture on the Babi Yar Massacre, Karel Berkhoff (picture right) highlighted historical research as a key requirement for commemorating and educating current and future generations on the evolution and impact of the Holocaust. He evaluated carefully the plans for a memorial to commemorate the Babi Yar Massacre as well as the criticisms the project faces in Ukraine. Thanks to the attendance of former and current members of the Center for Urban History of East Central Europe, the participants of the seminar got multilayered insights into the research, educational as well as commemorative activities and struggles in Lviv and beyond. Anna Chebotariova walked us through the stages of developing and implementing a memorial site on the grounds of the former Golden Rosen Synagogue that was destroyed during the German occupation. Taras Nazaruk and Taras Martynenko guided us to an elevated site on the outskirts of Lviv to show us the remains of the Janowska camp. The area itself is inaccessible since a prison was built on the premise of the former camp. As with every EHRI Seminar, the participants were also given the opportunity to present their own research projects and interests, which were further discussed during joint lunches and dinners. 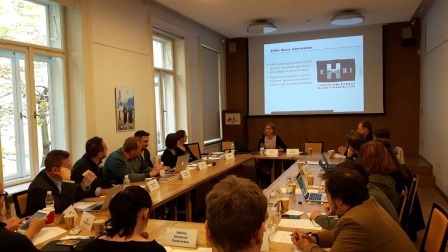 In her presentation of the EHRI portal and other services, Anna Ullrich pointed out the many different ways in which EHRI facilitates the establishment of a European network for Holocaust research and encouraged the participants to look into other EHRI services, such as the fellowship program or the EHRI Blog. Doubtlessly, one of the most outstanding events during this week filled with comprehensive lectures and presentations, stimulating discussions and poignant excursions was our last evening in Lviv. The progressive Jewish community “Khesed-Arie” had invited us for a presentation of different Jewish community projects in the region, including the Sholom Aleichem Jewish Cultural Society in Lviv and the NGO Rohatyn Jewish Heritage. Since it was the last evening of Rosh Hashanah we were invited to a festive and more than generous buffet at the community center where Rabbi Faynerman held a brief Shabbat service. And so, after a week of discussing the horrendous crimes of the Holocaust and how best to research, teach and commemorate them, we found ourselves celebrating the Jewish New Year in Lviv. What did the participants say?